The gates at the Young Street entrance of Scots School commemorate the connection between the school and the 2nd / 23rd Infantry Battalion which was raised in Albury. The Scots School is caretaker of the Battalion's banner. 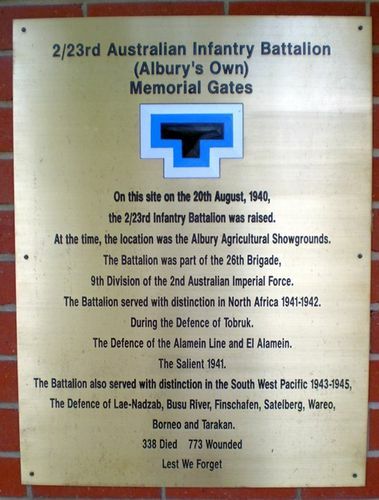 The Battalion was raised at the Albury Showgrounds in June 1940, as part of the 26th Brigade. Initially the brigade belonged to the 7th Division but in early 1941 moved to the 9th Division. The battalion did its initial training at Bonegilla before sailing for the Middle East in November. On the northern boundary of the showgrounds, the 2nd / 23rd Battalion and the Albury Grammar School became neighbours and mates. The School Cadet Corps loaned rifles to mount the Battalion's first guard, and bayonet practice was held on the school's Wilson Oval, much to the delight of the boys. Four of the Albury Grammar boys served with the Battalion. On this site on the 20th August, 1940, the 2 / 23rd Infantry Battalion was raised. At the time, the location was the Albury Agricultural Showgrounds. The Battalion was part of the 26th Brigade, 9th Division of the 2nd Australian Imperial Force. The Battalion served with distinction in North Africa 1941 - 1942. During the Defence of Tobruk. The Defence of the Alamein Line and El Alamein.